Our planet, this agonizingly beautiful little planet, is on hold. Seeking relief and release, in a perverse ecology we recycle outmoded, primitive paradigms, shuffling our feathers-and-molasses confusion between hands. In a time when we are required to deal with the politics of non-overlapping alien realities, we are not able to resolve the separations caused by our overlapping intra-species realities. It has rendered us theologically inane, philosophically naive, scientifically cramped, socially isolated, ecologically damaged, politically challenged and intellectually bewildered. It is clearly evident, after thousands of years of trial and disastrous errors, that the relief and release from our racially adolescent immaturity we seek as individuals and as a planetary species will not come from yet another econopolitical experiment, yet another U.N. negotiated conflict resolution, religious ecumenical conference, new age vision, academic philosophy, imposition of theocracy, new constitutional political format, much less some new twist on the MAD scenario, or war to end all wars. The purpose of this paper is to point out an overarching new paradigm that redefines and, thereby, resolves and supercedes the most fundamental cause of the divisions and conflicts between us and illuminates the now and future trajectory of the new planetary human. A very fundamental, critical question, therefore: Is it even possible to arrive at an overarching new planetary paradigm so comprehensive and robust that it corrects, subsumes, completes and outmodes all previous partial paradigms, explains all our previous explanations, with the scope and power to unify and pacify the planet? Unequivocally, yes. We are not incapable of getting off “maybe”. We are blocked only by primitive, antique legacies and the way to expunge them from the fabric of our cultures is now available to us. How adolescent a species are we? We are accustomed to analyze, evaluate and react to significant positive or negative events in the public and private sectors in terms of political, military, economic, scientific, psychological, sociological, or religious factors and ramifications. We do this in the context of a primitive economic, competitive mammalian politic based on territory and the defense of limited survival resources when national boundaries have been rendered meaningless and free energy sources are already available. The least evolved among us, in a perversion of the word “conservative”, preserve their wealth, built on limited energy supply, by deliberately suppressing developments that would make it limitless. As most current example, if confined to this context of mammalian politics, we surely will see, the “end of the west” --- the “wild”, Paleolithic, west at least --- and the rise of the European Union in its turn in the dreary cycles of competitive mammalian economics. Then the “rise” of China, perhaps, etc., etc..
Ideologically, philosophically, the four criterion bases which we generally use to determine the truth or falsity, beneficence or harmfulness, morality or immorality of information, theology, philosophy, science and “new age” values, rattle around in a criteria vacuum with little overlap and major conflicts because each tends to define a human being and the meaning of human existence in a quite different way. Among some humans, there is a slinking cynicism, an often unspoken, viral attitude in human society that holds the view that it is impossible to get out of the criteria vacuum, to initialize a common ground; impossible to get past the communicatory barriers of turf and custom, belief and taboo. When talking about the human we are largely ineffectual because we are Babel-factored, literally talking at each other about a different entity. Technologically, we are eager and close to being able to create artificial intelligence and consciousness, when we cannot agree on the nature of our own consciousness. How primitively adolescent are we? Most fundamentally and amazingly, we do not have a consensual, planetary, generic definition of what a human being is. We disagree about how we really came into existence, and what the nature of our developmental process is. We disagree as to the facts and interpretation and understanding of our species’ history. We have treated the sociobiological event of our beginning as a species as if we could never be sure if it ever really occurred. We have not resolved nor integrated our genesis and our history as a species and, therefore, are at a loss to understood our real nature and future trajectory. That we do not see this as a profound puzzle is further proof of our species primitive naiveté. These problems translate to the problems that are related to our children and their education. Currently, we matriculate our young, these amazing, parallel- processing, relativistic, quantum jumping, multi-dimensional consciousnesses, semi-illiterate and naive for fear of them questioning our shambling senilities. In a time when we need to stretch our historical sense to allow for the visitation of our planet by alien species from before our origins, we teach them drum and trumpet mammalian history fleshed out with desiccated, parochial, political platitudes. We teach our own children, privately, generally the same platitudes and clichés we were taught and brand them with the same religious, scientific, and intellectual taboos we were tattooed with as children and expect that they will somehow be ready to do better than we and perhaps even step into stellar society. Whether we deny it our not, our children show all the signs of being ready; they are underwhelmed and overqualified. We feel it. Nevertheless, we do not teach our minors philosophy although they are capable of calculus. We do not allow a teacher in the public school system to teach our children anything important about anything important because we do not agree about what to teach them, because we do not agree about who and what we are. We do not educate our children in the management and refinement and evolution of their personal spectrums of consciousness because we do not agree on what that spectrum includes. And the children are literally our future, we in the future. The current status quo is revealed, therefore, at its most fundamental strata, to be, simply a continuation of the primitive theo-political conflicts that we have known for the past three thousand years. The major obstacles that are most fundamentally influencing and hindering our planetary understanding and progress are cultural legacies, cultural lock-ins that are with us as the deepest dyes in the tapestries of our cultures, locked in legacies that influence our thinking, our science, our logic, and our concepts of ourselves. We are too close to them, or think that they do not influence us, or that they have been dealt with in the scientific or academic world long ago, or that we can just ignore them. We deal, furthermore, with all these problems in a Paleolithic, turfish manner from the isolated towers of Cartesian-Newtonian oligarchies. It has been said that the world’s most complex mechanism comes without an owner’s manual. We have many different and conflicting definitions of what a human is and a number of conflicting “owner’s manuals” by which a human is supposed to operate. The word “owner” is the key: there are two major “owner’s manuals” in the form of Bible and Koran, two in the form of The Book of Changes (The I Ching) and the Book of the Tao. The I Ching and the Book of the Tao are instruction manuals in which the “owner” is understood as the human consulting them. In the case of the Bible and the Koran the “owners” are not the humans but the deities associated with the manuals. This relationship of “owner” to subject, deity to servant or slave, is understood by the vast majority as “religion”. We hardly question this concept. Those who do question it have often been killed by those who do not. Those of one slave-code religion have often killed those of another slave-code religion over whose owner is the only real Owner or which code is the correct one. Ultimately, these slave-code definitions determine our cultures and their legacies and traditions and are the most basic cause of the separations, divisions, conflicts and wars between humans. Part 1, obviously, constitutes a very broad, serious and daunting self-indictment. I posit a caveat: When I name names and institutions, critically or otherwise, I intend them as part of us, as a self-indictment: it is simply we doing these things to ourselves. Let us be easy on ourselves, however, since we are the only game like us on the planet, the only example we can work with, the inadequate conceptual boxes we inhabit are of our making but also ours out of which to break. If these negatives were all there were, then the fears of those in future shock would be vindicated. If I had no suggestions, solutions, answers or resolutions to offer I would not have written this paper. So the second half of this paper respectfully offers an overview and paradigm that can take us, in the perspective of a deepened knowledge of our species and ourselves, to a new level of racial maturity and a degree of freedom previously unavailable. The new synthesis subsumes partial glimpses of a new politic, humanistic new world order, enlightened eco-economics, re-hashed Eastern or Western mysticism, a third culture, spiritualized psychology, all knowledge united in a grand consilience, or cerebral turning points. We now have the keys to integrate our past with our present and future in the concept of generic humanity, the critical factor for achieving planetary unity. While the evolutionists and the creationists have been battling it out through dramatic episodes of the Scopes soaps, another explanatory paradigm has been developing exponentially which subsumes, corrects, and makes obsolete, specifically relative to the human species, both of those rather primitive paradigms. While the scientific imperialists and the religious dogmatists have thought that they owned the discussion by proprietarily boxing the argument and defining the binary options, the Sumerian scholar, Zecharia Sitchin, has advanced a robust and coherent paradigm of our genesis and unique history that, if true, ----- and I am convinced that it is after working critically with it for 28 years ----- is profound, comprehensive, and fundamental enough to enable us to rewrite the entire history of our beginnings and the planet astronomically, evolutionarily, paleontologically, archaeologically and, literally, redefine ourselves as humans. Sitchin’s thesis illuminates that antique conflict with Nobel prize quality research, renders the, by now, Monty Pythonesque arguments outmoded, subsumes and corrects creationism, redefines Darwinism as well as its latter day detractions. He has been able to do this because he reads Sumerian as well as the Semitic languages including ancient and Modern Hebrew, and is steeped in the history. He has had the advantage of access to the accumulated scholarship and archaeological material from the Middle East rediscovered only in the last one hundred and fifty years. Zecharia Sitchin, one of two hundred Sumerian scholars on the planet who can read a cuneiform clay tablet like you and I can read a newspaper, has demonstrated that the Anunnaki/Nefilim (Sumerian/Hebrew: those who came down [from the heavens] ) , the transcultural “gods” known to all the ancient civilizations from the tenth planet in our solar system, Nibiru, colonized Earth 432,000 years ago and created the human species 200,000 years ago, by genetically crossing their genes with Homo Erectus. 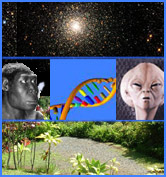 Corroboration comes from evidence for Planet X/Nibiru from the Naval Observatory , the Infrared search by the IRAS satellite in ‘83-’84; genetically from the mitochondrial DNA "search for Eve"; anthropologically from the "out of Africa" data placing our genesis in Central Africa 200,000 years; enigmatic ooparts and close to two million pieces of artifact and documentation recovered directly from the ancient civilizations. Our modern science has provided a means of identifying advanced science in the ancient past previously thought of as fantastic even for us. The advances in our scientific discoveries in genetics, mitochondrial DNA research, space and planetary science, archaeology, paleontology, anthropology, and linguistics as well as even the physics of metallurgy have enabled Sitchin to demystify the advanced technologies of the Anunnaki and identify and explain ooparts . We have progressed from being their slave animals to limited partnership and, since they phased off Earth, are now phasing out of a 3000 year traumatic transition to racial independence, a rapid metamorphic process, under the imperative of our advanced Nefilim genetic component. Central to the history of the Anunnaki’s occupation of the planet was the interaction between two brothers, Enlil and Enki. Enki was their chief scientist who was responsible, with his sister Ninhursag, their chief medical officer, for the genetic creation of our species. Enki, obviously, was sympathetic towards humans and promoted our interests and us. Enlil, eventually known as Jehovah/YHWH, of the Old Testament, maintained the position that humans were to remain slaves, totally subservient to the Anunnaki and him especially. The Anunnaki phased off this planet at the latest around 1250 B.C. For some three thousand years, subsequently, we humans have been going through a very traumatic transition to racial independence. Proprietary claims made by various groups of humans as to who knew and knows what we should be doing to get the Anunnaki to return or when they returned, perpetuated the palace and social rituals learned under the Anunnaki and sometimes disagreement and strife broke out between them. Religious ritual is the transmutation of palace servant duties. The serving of favorite roasted meats on the Anunnaki table became the offering of “burnt offerings” on the table now become an “altar”, the transportation of the Anunnaki local ruler on a dais became a procession of statues, the Anunnaki palaces became “temples”, etc. The Anunnaki were, clearly and unambiguously, known to the humans who were in contact with them as imperfect, flesh and blood humanoids (taller and huskier than we, male and female, the males bearded. We look like they look because we are half Anunnaki). It was only much later that the Anunnaki were eventually sublimated into cosmic character and status and, later on, conveniently mythologized. Breaking the godspell has seen us go through the stages of abandonment to dissociation, transmutation, religion, rebellion and now to recovery. We have been dysfunctionally looking to the sky where they went for some three thousand years caught in cargo cult religions. We are ready to step out of racial adolescence. The "occult" is time-release packages of advanced technological information entrusted to us in "crash courses" in civilization, often lost through time, now being recovered through the clues and recognition afforded by our own science. Ooparts, high-tech tools, toys, artifacts, “out of place” in time are remnants of lost technology and knowledge. Transcendental experience is redefined in terms of dimensional expansion of consciousness and perception. We are rapidly evolving to habitual four-dimensional consciousness. Transcendence is conscious metamorphic dimensional exploration, participatory expansion at the leading edge of our special-case evolution. The totems and taboos of our racial adolescence dispelled, Prometheus can get off his rock and reach genetic satori; Job can get off his dung heap and complete his EST training; Buddha can open his eyes and reach genetic enlightenment. Mythology is our greatest myth. We can move beyond the interpretation of the gods as myth, Jungian archetypes, and schizophrenic hallucinations. History as hallucination and “mythinformation”, after two hundred years of explanatory failure, although still hiding behind tenure in the university and between the glossy pages of new age magazines, is a dead issue. Why is the Sitchin paradigm so pivotal? It is the meta-paradigm that affords the potential to remove the resultant, stultifying, locked-in legacies that have kept up separate and enervated for millennia. The new paradigm is so encompassing and penetrating that it is a unique meta-wild card: it redefines every cardinal element of human existence that we think we have understood including a redefinition of our evolution, all our cultures, our religions and of our very selves. Those who talk of a singularity, a shearing drop to extreme novelty and fundamental revolutionary change at some near point in our future that is so profound that it will change human nature do not have to look any further than the Sitchin paradigm. It is there for the acceptance and it will rewrite the entirety of our history and redefine human nature. After a century and a half of examination and attempted explanation ---- and suppression ---- of the historical, archaeological, anthropological and astronomical evidence accumulated, no other explanatory paradigm comes close to the totally coherent, robust and logical Sitchin thesis. Can and will it be improved or corrected? Certainly. Just within the time of the writing of this paper there has been a report of the discovery, by satellite scan, of a city, two miles by fivemiles in area, under thirty feet of water in the ocean twenty five miles off the northwest coast of India. Preliminary carbon dating of dredged materials from the site indicate its age as nine thousand years old, placing it earlier than Sumer. The histories of India (declared myth by the British because they were older than the Empire) speak in detail about civilizations and humans in the very remote past and mention this city by name. What appears to be a city has been reported off the coast of Cuba under an astounding 2100 feet of water, discovered by professional treasure wreck hunters using sophisticated equipment. The Takenouchi documents and artifacts, ancient treasure of the Japanese Emperor guarded for 2500 years by the family of the highest Shinto priest caste family, speak of an alien civilization coming here from space and founding the human race. All these facts and histories need to be studied thoroughly and integrated with the histories and data from the entire planet. We have much work to do. The planetary benefits will be enormous. Besides the obvious general advantage of working from a consensual understanding and definition of what a generic human is, we can eliminate the characterizations of the perennial conflicts as being between “progress and piety” or between creationism and evolution, or science and faith. The new paradigm finally and conclusively resolves the creation-evolutionary conflict specifically concerning our unique genesis. If the new paradigm is substantially correct then the box is illusory, the creationists are only half wrong and the evolutionists are only half right: there was a creation but it took place in a genetic laboratory; there is a human evolutionary process but it was interrupted by the Anunnaki inserting their genes into the Homo Erectus gene code, a very pragmatic, non-Darwinian kind of interference. We were created and we are evolving but both in unique ways. In short: the entire set of world views, theistic, theo-political, cultural, philosophical and scientific that purport to explain our genesis, history, and development as a species are about to be replaced as we recover finally from racial amnesia. The revolution is inevitable. It will take probably a century to fully accomplish socially because of the sweepingly profound nature of the resulting change, the natural resistance of the established institutions, and the need to reeducate and transition without disorientation. The new world view is gradually taking hold, cannot be ignored, and is waiting in the wings. It is only a matter of time. A unique and vital characteristic is that it addresses and explains and redefines the root source of all the ancient religions of the world on a common basis so that no particular religion can claim privileged status of any kind. Religion, as we know it, will be understood in the context of our unique history. The significance and ramifications of this tremendous body of work, correlated with findings from all other disciplines, as they bear on our present and future, has been my primary focus since 1976 when I began work on Breaking the Godspell, the reaction to which has been predictable and certainly not boring. There is no better example of the Galileo effect (we will not look through your telescope because we know what you say you see can’t be so) in the academic and scientific arenas than the reaction to the Sitchin paradigm. Campus, scientific, and theological imperialism and the fields of anthropology, archaeology, and astronomy, particularly, have tried all the usual unprofessional, unscholarly, shunning, chest thumping, fang baring, proprietary turf posturing and ad hominem attacks through teeth clenched in tenure tetanus, but the thesis becomes more and more robust as new evidence comes in continually from archaeology, anthropology, astronomy, genetics and other disciplines. If Darwin’s thesis was a blockbuster, Sitchin’s thesis is a hydrogen bomb. We may have been able to afford to dally with Darwin and defer to religion for as long as we have but the rapid changes in modern times will force us to consider Sitchin’s thesis seriously and intensely on a much shorter basis. Of course, most scientists and sophisticated scholars consider themselves enlightened in that they espouse some form of Darwinian evolutionary theory as the party line, although there are serious arguments even within the scientific arena as to the full validity of the Darwinian thesis. Generally, philosophers and scientists apologize if they think they are even possibly sounding like creationists, spend most of their energy in either promulgating some version of Darwinian evolution or attacking what they judge to be its too radical application, get entangled in arguments about whether Darwinian evolution can be invoked to explain human creativity, even aesthetics, and generally put down any other explanation out of hand. The general thesis of the evolutionist, therefore, reads like this: the acceptance of evolution as the mechanism by which we came about causes us to understand that we are a collection of biological molecules, interacting with each other as in a mechanism, according to well defined laws and rules derived from physics and chemistry ---- although not all known or understood by humans as yet. Defining consciousness within this biological model is still a pivotal problem: some say it is simply an epiphenomenon, an effect of the operation of all the parts of the brain working in consort, some say it is the subjective self-perception of herself or himself by the individual, some say it must be based in some “new stuff”, some new physics or chemistry that we don’t yet understand. Across the general population, however, we do not even agree on whether we are evolving, what the process really is if, indeed, we are evolving, from what source and how we began, and in what direction and on what trajectory, whatever that process is, we are headed. We do not agree, even more fundamentally, as to what criteria to use to judge these matters. We are not discussing the same entity. Creationists, obviously, do not think of humans as having evolved in the past or as evolving in the present. If we do not agree that we are evolving, can evolve, or whether any evolution of a species or individual must be by mindless Darwinian mechanisms, or whether there are effective methodologies for expediting conscious self evolution, we will continue to be at standstill. It is quite ironical, however, that even most of those who hold for some evolutionary view of humankind evolving to human status in the past do not seem to think in terms of humans evolving in the present, much less having a well defined conceptualization of what that process might be. Charles Darwin published his arguments for evolution in 1859, one hundred and forty three years ago. Schliemann opened the buried Pandora’s box of our real archaeological history in 1873, one hundred and twenty four years ago. Sitchin, having gained the advantage of discoveries in archaeology, astronomy, space travel, genetics and linguistics as elucidating and explanatory tools, published first only in 1976, already over a quarter century ago. Using this rough chronology as a guide, we might anticipate, even with some exponential bit of acceleration, that the initial general recognition and acceptance of the Sitchin paradigm will not happen for, perhaps, some fifty years. We really can’t afford, however, to see Kuhn’s thesis that scientific revolutions take place only by the old guard dying off rather than by an acceptance through careful study, critique and proving out, borne out once again. In searching for a word to clearly distinguish between the various Darwinian type theories of evolution usually applied to all species including ours, and our unique evolution as revealed by our history, science and genetics I have found it convenient to invent the word “Realevolution” . Clearly we are evolving but in an accelerated, unique way after coming into existence through a genetic engineering project. That we have adapted loosely in a Darwinian sense over time is also true but the fact that we realize we can control and manipulate our realevolutionary progress and direction goes far beyond the concept of natural selection by chance genetic mutations. Consider the facts of our unique genetics and differences from any other anthropoid or humanoid. Current investigation says our genetics are about 98 percent the same as a chimp’s. Regardless, that two, perhaps only one percent obviously makes a vast difference. We have 46 chromosomes, primates have 48 and the fusion of the second and third chromosomes in primates is a mystery. Even today, the anthropological sector is scrambling to find a viable ancestor species for us; Homo Erectus is currently being promoted. We were contemporaneous with Neanderthals or even preceded them. We showed up too suddenly in the chronology of the fossil record. We present with very many startling, obvious differences from primates, and those differences, suddenly appearing in our species, are radical: we have foreheads, hardly any brow ridges, eye sockets far more rectangular than round; relatively tiny nasal passages; small flat mouths and a chin; far less muscular strength and bone density; our skin, sweat process and glands, body hair, throats, and salt management are completely different. Human females do not have an estrus cycle. We are bipedal. Our brains are remarkably different to say the very least. It becomes quite obvious why we (as a product of a melding of two racial gene codes where quality control was conditioned by pragmatic purposes) have some four thousand genetic defects and counting rather than none to a handful as all other species, in light of the complexity of the merging. Homo erectus, our half ancestor, took a million years to go from rough flaked stone tools to smooth ones. You could hardly notice any change. We have come from square one to going to Mars in only some 200,000 years. If the Sitchin paradigm is correct, all these facts are explained easily. If we ignore this body of information as we read out and work with the human genome we handicap ourselves unnecessarily and deprive ourselves of valuable clues and understanding. Darwinian principles may generally apply to hominid species before us but they clearly do not apply to our unique synthetic genesis and subsequent development except as a minor theme in our climatic and incidental regional adaptations. If the Anunnaki were interested only in engineering what clearly amounted to disposable units then it may reasonably be inferred that the completeness of the engineering would not have to have been taken to the maximum. This is, in the opinion of this author, the basis for the four thousand plus genetic diseases and defects we present. It has been argued, theoretically, that, although the vast majority of the species on this planet present with only a few typical genetic diseases, we show 4000 because of the relative complexity of our organism. However, we are not that much more complex genetically than even the higher primates and this argument does not hold. Sociobiology, as introduced and propounded by E. O. Wilson, is founded on Darwinian evolutionary theory, and the "unappealing proposition" that genetic variation and chance are the only cause for the existence of human kind, inferring a complete biological determinism. There is difficulty, however, in accounting for the disconcertingly rapid accelerations obvious in our species’ brief history in which the slow genetic mutational and chance factors have been rapidly outrun by our cultural and consciousness developments. It may well be that we are totally determined in our action and thought by our biology but the very fact that we can recognize that possibility and discuss it begs the question How then are we determined? Wilson’s honesty causes him to acknowledge that we have reached a point where we can consciously influence the course of our evolution. The new paradigm affords a context and perspective in which to understand our species’ precocity in terms of the rapid ascendance or our advanced Anunnaki genetic base. We can return to the subject of man's ultimate nature with confidence, freedom to radically experiment and explore with understanding and humor. The same reductionistic science that would honestly insist that we are totally determined by an infinitely regressive loop of ultimately quantum mechanical events is already telling us that we are determined to transcend in an infinitely progressive loop of fractal like expansions. If we are totally determined, we are clearly determined to determine our own determinism. The fact that we have modified since our inception according to Darwinian adaptations to general climatic, regional and cultural vectors becomes a minor theme in the overview of ourselves as the precocious leading edge of a synthesized species metamorphosing rapidly, driven by our bicameral genetic engine. The “unappealing proposition” loses its sting: the truth, regardless of its content, tends to set one free. The new paradigm explains completely the seeming anomalies of acceleration, ooparts and syncretisms so apparent in the human situation, and is a definitive explanation of why our species’ "biological evolution is always quickly outrun by cultural change". The Sitchin paradigm provides a comprehensive context in which to understand and explain the enigmatic facts and anthropological anomalies of the Darwinian model of our species existence, which we have already amassed. It provides the context and data for bringing the efforts of geneticists and the genome projects, often scattered for a variety of reasons, to a focus on correcting and perfecting the genetic code, eliminating all disease and handicaps, and providing us the option of immortality. Immortality is a pivotal topic in all considering and learning from all phases of the Anunnaki-human history. We know, directly from the records, of their decisions that the Anunnaki did not give us the relatively extreme longevity or immortality they possessed by conscious deliberate decision. It did not fit their purposes: we were invented as slave workers. The records also show, however, that, over time, a handful of humans were granted immortality also by deliberate decision as a reward for being good subordinates in various roles usually as kings/foremen or for carrying out some critical mission. Another lesson: there may well be identifiable gene sequences that control the aging and dying process that are clearly and definitely manipulatable giving indication that we will be able to rectify their possible deliberate suppression. During the genetic investigations now in process, therefore, it would be valuable indeed for geneticists, at the minimum, to be constantly inspecting the results of the decipherment for signs of the genetic merging, and to develop protocols to determine such, if needed, as well as following the clues mentioned herein. By doing so, interpretations and explanations may possibly be facilitated, progress accelerated and a far more comprehensive overview of the genome achieved. The information gained would be, reciprocally, a major, pivotal, invaluable resultant spin-off contribution to our species’ evolutionary, anthropological, and cultural generic history. Understanding our bicameral gene code in the context of the new paradigm will facilitate the elimination of the schizoid puzzles in our collective and individual psyches and the correction and perfecting of our genetics. How primitive are we? The view from 2100 says very primitive indeed: we are only beginning to approach the time when all diseases are preventable and curable. We still pollute our environment and cause ourselves disease. We have not overcome aging and death and are afraid of immortality. We get born, no owner’s manual, to often dubiously qualified, puzzled and puzzling parents, subject to a multitude of diseases, struggle to make sense out of what the hell existence on this planet in this universe is all about and how to deal with it, wonder why there are so many conflicting philosophies and institutions claiming cosmic franchising and, often, why the universe seems so unfair and then we die. We are generally conditioned by theocultural traditions to accept these bizarre conditions as “normal”’ and the will of some god. If we rethink our situation in terms of our restored history, however, things make a great deal more sense although, for now, there may not be a planetary cure or relief for some of them. If we recognize that we are the product of a genetically engineered melding of two quite different gene codes, literally a bicameral species, displaying a decidedly non-Darwinian kind of evolutionary development, just now beginning to step out of racial adolescence, only now beginning to grasp our racial psychology, possessing a gene code that, significantly and disconcertingly, manifests four thousand and counting potential genetic defects, struggling desperately with a short life span and certain mortality, we will know precisely who and what we are. By enabling us to break the godspell we are freed to collectively work toward planetarily common goals in genetic science: the correction of the defects in our genetic code, the elimination of diseases in all of mankind, the providing of the option of immortality to all. In the greatest perspective, perhaps we should recognize from the outset that immortality will be both a new and awesome plateau of human existence offering as yet probably undreamed potential and yet, without denigrating that potential at all, ultimately just another "trip", just another step in our meta-evolution, the rapid metamorphosis we have been undergoing since our beginning. Within those extremes there is the greatest latitude for the inevitable expansion into dimensions which will allow us to become far wiser, individually, through greater experience, greater learning, and the ability to witness the patterns of repetitions of extended periodicity. Eliminating the pressure of a short life span that influences our choices and cramps our lives will not just give us the practical potential to travel easily between star systems and send the insurance companies into the re-edit mode; it will change our perspective and our social interactions, certainly the entirety of human existence, radically. Over the last 2000 years we have seen scientific or pseudoscientific doctrines espoused by the various religions being contradicted or demolished and the religions, repeatedly, although with great delay, change their positions with regard to our genesis, history, evolution and science, and modify their doctrines. But the new paradigm addresses the very root doctrines, positions, claimed divine franchise and authority of all the religions of the world and will eventually cause the obsolescence of all institutionalized religions springing from our ancient relationship of subservience to the Anunnaki. Religion, as we know it, is the transmutation of the Anunnaki-human relationship of master-subject servitude, of slavery and then limited, subservient partnership, the godspell. The concept of God, capital G, has gradually developed through the cosmification of the various Anunnaki rulers Enlil (Jehovah/YHWH), Enki (Adonai, the Lord), Allah (El/Nannar/Sin), among others, gradually embellished with the heady concepts of metaphysical speculation. It has lately become a sort of faux ecumenical gloss: the TV news quotes the Koran as saying “There is no God but God” when it should be “There is no god but Allah”, a completely different meaning. The god of the Judeo-Roman Christian tradition, Jehovah YHWH was – quite possibly still is -- the flesh and blood Anunnaki individual, Enlil, eventually cosmified into the absolute creator of the universe, eventually spoken of as infinite love, infinite justice, infinite this or infinite that, through the bishops and the scholastic philosophers and theologians. The idea of a cosmic, infinite principle “God”, as many of us still take it for granted, is a thoroughly mixed composite concept of the sublimation of the anthropomorphic and imperfect Anunnaki individuals, the “deities” of slave code religions; metaphysical abstractions accumulated over time through the speculations of the revered philosophers from the Greeks onward; the Hellenic influenced, theo-philosophical teachings of the Roman Church scholastic tradition and mystics; flavored with the concepts of theists, deists, agnostics, theosophists and mystics of any number of sects; and thoroughly leavened by the concepts of the consciousness expanding disciplines and metaphysical doctrines of the East, sprinkled with our own individual intellectual and emotional subjective variations and usually still conditioned by the godspell element of subservience. But that cosmified, composite, intellectual abstraction is not the Jehovah/YHWH or Jesus of the Judeo-Christian religions, the Prime Mover of Thomas Aquinas or the Omega point of De Chardin, the Allah of the Muslim faith, the Brahma of Hinduism, the Buddha, or the Tao or deity of the religion of your choice. Many who do not realize this crucial distinction, do not want to, or are not ready to, take refuge in the Big-G little-g syndrome, a sort of halfway shelter on the way to genetic enlightenment. That position is articulated as, “I see the real historical nature of the “gods”, the little “g’s”, but that does not shake my belief in a Big G”. That way they can still subscribe to the platitudes that the “God of all religions” is beyond individual doctrinal differences and contradictory theologies, “all paths lead to the same God” and similar inane notions. The new paradigm affords us the opportunity to sort all these elements out, identify the different individual real gods of the various religions, place them and ourselves in historical perspective and recognize the metaphysical conceptualizations of “deity”, East and West, as a product of our own evolving racial psychology. Yes, the new paradigm means that religion and religions, as we know them, will have to bow out. The godspell phenomenon has two parts: we need to overcome the slave mentality of dependence and subservience and we need to discard the institutional religions which sprang from and dominated through it, especially the radical fundamentalism, West and East, that is ultimately tearing the race apart. The role of the theologian then becomes the facilitating of planetary reconciliation in the transition to the time beyond religion. The institutional, slave-code, godspell religions, have fixed dogmas which are directly contradicted by the new paradigm. They claim divine franchise by gods who are now radically redefined. They claim absolute authority over the disciplines that produce the information that would demonstrate their true historical nature. The ultimate driving force will most probably be a degree of desperation and desire for peace gradually manifesting in the entire planetary population so strong that it will cause an abandonment of the authoritarian leaders and dogmas of the religions, followed by a younger generation of clerics who will recognize the inevitable and introduce new interpretations and relaxed rules to gradually smooth the phase out and transition, hopefully to humanitarian organizations and peace movements. The signs of transition of some religious organizations to charitable and ecological focus may be seen as an almost inchoate beginning of this kind of transformation. It would also be foolish not to expect diehard fundamentalist backlash. Is this atheism? No, paradoxically, not as such. Not as we have defined atheism previously as the denial of the existence of any kind of god, cosmic or otherwise. It simply is a long overdue correction of some local, intra-solar system politics, relatively rather pedestrian in cosmic perspective. Garden variety atheism can now be understood as an early sign of precocious species adolescent rebellion and questioning of the authority of the obviously all too humanoid characteristics of whatever sublimated local Anunnaki "god" is still the object of worship (the original meaning of worship was “work for”: AVOD = work). Yes, the subservient godspell religious stage will be surpassed. The resultant freedom, however, will engender and foster greater curiosity about reality and a seeking for ultimate causes far more metaphysically adequate and commensurate with our expanding consciousness far beyond even the search for the Law of Everything. The element of transcendence associated with some religions will be, at minimum, understood as generic consciousness expansion into higher and higher dimensionality. Neither is this materialistic reductionism although it does force us to reconsider the notion of the “spiritual”. What is needed is a complete overhaul of all our metaphors and concepts of the “spiritual” because the great majority of them are embedded in our cultural fabric and consciousness as leftovers from Judeo-Roman Catholic theology and second hand Eastern philosophies. The importance of this overhaul is critical because it involves the concepts of mind, consciousness, intelligence, will, self-awareness, transcendence, dimensionality, self. The new paradigm is the basis, perhaps the only adequate basis, for a profound unification of all humanity. Not some superficial token ecumenicism or social homogenization of peoples and cultures and philosophies but a unification that frees us to be one species and explains and enhances our diversity of adaptations and cultures and contributions. The cumulative evidence and restored history has enabled us to grasp the true nature of our genetic creation, our traumatic transition, and the opportunity to emerge from species adolescence and amnesia into species maturity. All the political, economic, social, scientific, new age, evolutionary variables are only symptomatic; the genetic level is where the profound realization must blossom. The restoration of our generic history and a generic definition of what a human is afford us the advancement that will take the planet off hold. This is the end game of an age, be certain. A new human and a new civilization beyond religion and the old new age are on the horizon. I submit that the most fundamental, profound, overarching, sociological transformation we are going through at this point in our history is the change from the theo-politically controlled and manipulated explanations of our beginnings and history to species independence. We are witnessing the last gasp of religious fundamentalism worldwide. Whether we chose to acknowledge it or not, we are already well into one of “…. those Grand Moments when the whole scale of being is reevaluated” as John Petersen has characterized it. It is within these redefinitions that the resolutions to the problems and obstacles deeply embedded in our species’ and individual psyches’ are to be found. To paraphrase Dylan Thomas rather crudely, let us not go blind into that daylight. But how do we accomplish the transition from our current planetary standstill to planetary consensus gracefully and quickly? It’s best to recognize from the outset that the revolution required, the meta-wild card so radical in its implications and ramifications and requirements, that there is no single discipline, no institution, certainly no individual or group who can bring it about alone. It is so planetarily encompassing that stepping outside of this box is almost impossible. The change will have to come from within. Science, the closest we have come to a common ground, a common criterion, has played and will continue to play a pivotal role in the recognition and acceptance of the new worldview. Astronomy will demonstrate the existence of the tenth planet unequivocally --- the IRAS, Infrared Imaging Satellite, quite obviously discovered it in ‘83-’84 --- and, reluctantly, recognize the correspondence of the details gradually accumulated with the ancient data we now possess. The curiosity about the existence of the Anunnaki on Nibiru/Planet X will become overwhelming and contact through spacecraft and signaling will commence. Archaeology, for the last one hundred and fifty years, has been making the major contributions of data and will continue to do so. Only recently, the science of genetics has been able to refine, sometimes correct, archaeological and anthropological estimates and dating. Because of the intertwining of the archaeological and genetic information concerning our unique genesis, genetics has already and should continue to be a major tool and contributing science to the new paradigm. The more robust the scientific information becomes the easier it will be for the religions of the world to accept and incorporate. Nations and cultures as well will see the cogency of the information and gradually accept it, becoming gradually more planetary in outlook. In the name of world unity and peace, governments and contributing entities should increase funding of the scientific searches and research in these disciplines and adopt policies that will release the information, some of it quite certainly withheld at this time, already possessed. A major contribution to the resolution of the conflicts between the religions of Western culture in this regard is the work of Sir Laurence Gardner. Sitchin’s work and the major discoveries of the Dead Sea Scrolls, has enabled Gardner, an English genealogist—historian to make a recent breakthrough. Gardner has the advantage of one hundred and fifty years of discovery and translation of the Sumerian source material, knowledge of Anunnaki politics and the interaction of Enki and Enlil implemented by the latest scholarship on the Dead Sea Scrolls and Nag Hamadi documents through the brilliant work of the Australian theologian, Barbara Thiering . Working as a genealogist with data available through privileged access to the private archives of thirty European royal family clients, Gardner has brought to light the fact that there exists a robust, highly documented, genealogical, genetic history of a special bloodline carrying all the way back to the Anunnaki and Sumeria. This information, possessed by the heterodox tradition of Christianity, which is only now coming forward, no longer fearful of the boiling oil of the Inquisition, has always been available. He has identified the Holy Grail as this bloodline of humans, enhanced by Enki with additional Anunnaki genes, intended to be human leader-rulers in a tradition of “servants of the people” traceable all the way back to Sumer. The modern word Grail traces back to graal, san graal, which, etymologically, stems from the Sumerian root words GRA AL, meaning special bloodline. The bloodline of human leaders, further enhanced with Anunnaki genes, initiated by Enki (The Lord, Adonai), passed from Sumer through Egypt to Israel through David and the messiahs (anointed ones), fostered by the Essene communities as revealed in the Dead Sea Scrolls. Jesus was an Essene in the bloodline as was Mary Magdalene. They were man and wife and had children. Jesus was of a liberal persuasion within that tradition. This strain of Hellenistic, liberal, Judaism eventually became known as heterodox Christian (the word Christian was not coined until almost four hundred years later) was opposed by the Pauline branch which eventually allied itself with Rome and became the Roman Church. The orthodox Roman Church perpetuated the slave-code fear and subservience tradition and, in its turn, suppressed, persecuted and brutalized the human centered strain of the bloodline. The reason why women have always been denigrated and suppressed by the Roman Church is genetic: the bloodline was dependent on transmission through the women of the line and any recognition of them would be recognition of the line. This is a further elucidation of our genetic background. It is manifestly unjust that the geneticist is deprived of this vital block of information about the genome due to the preclusive attitude of the “bishops” still reigning in archaeology. We are the product of that Nefilim technology, a mutant species with bicameral genetics, bicameral mind. We can finally integrate both halves of our nature. Our Homo Erectus component will bring us back to harmony with this planet, making it a nice place to live and a nice place to visit. Our Anunnaki component will teach us how to move off planet gracefully. The word from station DNA is these "gods" wear designer genes. Neil Freer is a researcher, writer, lecturer, philosopher and poet living in Santa Fe, NM. Neil and his wife, Ursula, have lived in the Eldorado area since 1994. Neil holds a BA in English and did graduate work in Philosophy and Psychology at the New School for Social Research. (I have purposely foregone graduate degrees because they focus one more and more narrowly on a particular specialization, tend to constrain one's thought and exploration to the established, consensual paradigm of the moment and bind one to tenure, peer and funding pressures.) He has taught college courses in Philosophy and History of Religion, gives private and public seminars and lectures and has done over two hundred radio and TV interviews. Neil is the author of Breaking the Godspell, a book which explores the ramifications of the archaeological, astronomical and genetic proof for our being a genetically engineered species and presents the ramifications of this new paradigm of human nature that resolves the Creationist-Evolutionary conflict. Info on ordering the book.